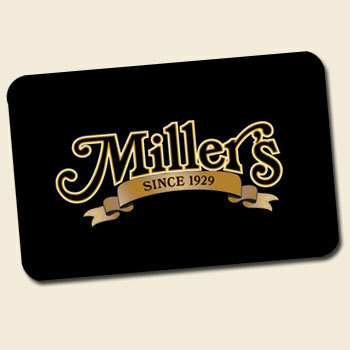 The Miller’s Gift Card – available in denominations of $25, $50 and $100. May be redeemed at Miller's Smorgasbord, Miller's Gift Shop, The Quilt Shop at Miller's and Locally Made Food Shop. **Please note we cannot ship to Hawaii, Alaska, or Puerto Rico. We apologize for this inconvenience.